Friendship Scrapbooks are a great way to send some memorable pictures and quotes to someone who needs some encouragement, or just because you feel like telling that person how special they are, or in my case, to farewell an online friend whose husband was going to move them overseas. and somewhere in the middle we became the best of friends". 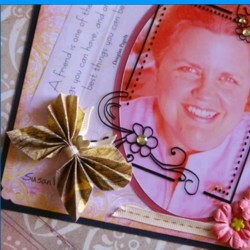 Several of us crafty friends decided to band together to make a special book for her, with each of us completing one 6" x 6" page, for her to take away with her and remind her of us. 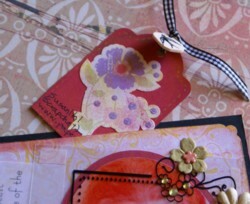 I decided to add to my page by making a scrapbook tag to hide behind my layout. It had my contact details on it and a personal note to encourage my friend that her Internet buddies are only a click away, no matter where she and her husband will be living. 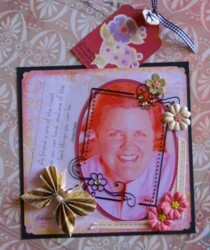 And there you have it - one Friendship Scrapbook page! I then sent the Friendship Scrapbook page I made on to another friend who was compiling the finished album before presenting it to our about-to-move-away friend. (Edited: She loved it!) 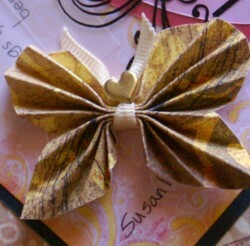 Do you want to know how to make the paper butterfly you see here? Although I had seen these made before, I didn't know how to make them. I learned how to make this one from the wonderful Tanyah. All you need are scraps of paper and you can make one too! If you would like to know how to make a paper butterfly I made you some step-by-step directions. Let me know if you decide to make some. I'd love to know how yours turn out.